KAD is a complete 2D CAD system, suitable for both beginning and experienced users. It is based on QCad, a CAD system by ribbonsoft. KAD is available under the GNU General Public License, version 2. The KDE adoption is written by Martin Teichmann, who is not related to ribbonsoft (therefore don't blame them for bugs). Until now, KAD can only be considered alpha software, unstable, lacking functionality. For the KDE user interface part that is, as QCad is already a production quality CAD system, the CAD part is actually very stable. The sourcecode is available as a tgz file here: kad-0.8.2-Source.tar.gz. The newest developer version can be downloaded from the git server at http://git.tuxfamily.org/kad/kad. Unfortuantely, tuxfamily have not yet set up an anonymous access to the git, but once this will be done you should be able to just say git clone git://git.tuxfamily.org/gitroot/kad/kad.git in order to download the whole repository. For details on that see the tuxfamily FAQ. There is a binary package available at kad-0.8.2-Linux.tar.gz which contains the binary. Just unpack the tgz, for example with tar -xzf kad-0.8.2-Linux.tar.gz then you can run KAD by executing kad-0.8.2-Linux/bin/kad. KAD is a KDE3 program, so you should have both KDE3 and Qt3 installed. where the last line is to be executed as a root user in order to install KAD system wide. A note at the side: the two directories kad-0.8.2 and kad-compile are two parallel directories, not one the directory in the other one. This is called an out-of-source build, the cmake wiki contains more details if you are interested. 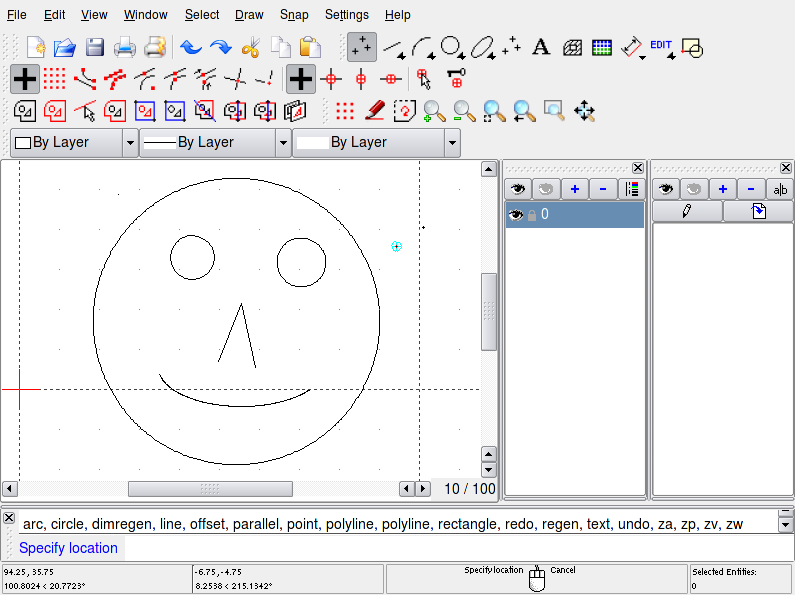 If you are used to QCad, this user interface is rather unfamiliar to you, if you are used to KDE on the other hand it should be rather straight forward: there are icons with which you can draw lines, circles and other elements. If you click long on such an icon you get a detailed list on which kind of line or circle you want to draw, so clicking alone on the icon actually does nothing. You also have icons to snap the points you draw to certain elements. Another group of icons lets you select a set of elements in the drawing. As this software still has alpha quality, many bugs still exists. If you found one, write an email to lkb dot teichmann at gmail dot com. Anyhow, I also appreciate every other way of helping me on this project. The next step in the development of KAD will be a porting to KDE4 - I don't see a reason to stick with Qt3 and KDE3, since soon the whole world will shift anyways.